I know what you are thinking…. “what? another Liberty book review?” Well,why not! This is, after all, a beyond lovely book. So if you have a few minutes spare, I invite you to stay with me and read this short review and also, see a bit more of the inside of this book, if you haven’t already bought it yet of course! Like the overwhelming majority who already have this pretty book in their hands, I too must say that this is just such a beautiful book. Quadrille, the Liberty team and every person that collaborated in the creation of this book managed to encapsulate the very essence of Liberty within it. If you have been to Liberty, the shop, you will probably agree with me that is full of beautiful things, some might not be to your taste but you cannot deny that many of the designs are amazing, beautiful textures, luxury smells, the place is full of so many shinny things. But what are all those things? Well, they are normal, everyday things, like slippers, bags, scarves, fabrics, buttons, plates, diaries; they are just beautifully designed, amazingly pretty and well, sometimes the price is a bit steep. 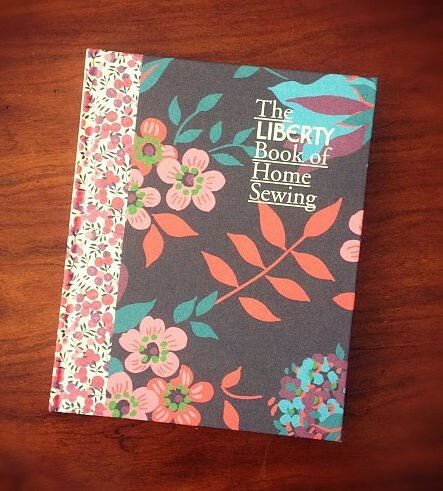 Well, The Liberty Book of Home Sewing is full of patterns for many “normal” things like shopping bags, a flower brooch, book covers, quilts, pincushions; however when they are made with very pretty and ultra traditional Liberty prints, they become something special, almost decadent. I have already marked two projects from this book that I will make myself, which will become very nice Christmas presents , I will keep you posted about these, and as always if you have made anything from this book already share it with us, we would love to see it! We are so excited about our new shop and the weather has been fantastic that we thought we should have a sale. We were sure to include some of your favourite designers, so you will find fabric and patterns from Amy Butler, Liberty, Patty Young, Sandi Henderson, and Tanya Whelan among others. All of the fabrics on sale are very versatile and can be use for small or larger projects. They can also be matched with other fabrics that we have in stock and create many adorable things. The sale will last until end of May. If you want to be the first to know when we have a sale subscribe to our newsletter and you will enjoy discounts only available to subscribers!